Zombie deer have been spotting across the US and some people out there might have already been infected, waiting to turn into zombies in the near future. Machine guns might get a little too expensive and surviving the apocalypse is certainly gonna be rough. Not everything is easily obtainable but that doesn’t mean you can’t survive just because you’re broke. It’s more about what you spend your money on that’s important than how much stuff you got! 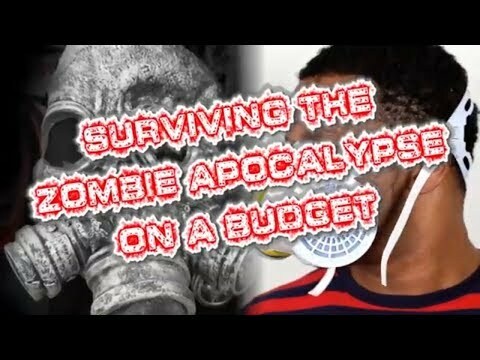 From inexpensive weapon alternatives to the most affordable and nutritious food you can buy, here is surviving the zombie apocalypse on a budget. OK so you need some ranged weapons now and you’re not too sure how well it’s going to work out with a firearm since you might run out of ammunition and that the noise might attract attention from the zombies. Don’t underestimate to potential of a slingshot with it’s potential to be able to shoot just about anything as ammo. Not only that, but their extremely quite and can be surprisingly powerful. With all of this new advanced slingshot technology, David could have slayed quite a few more giants! Here we see a hunting laser slingshot that can also be equipped with a flashlight. It can fire arrows effectively in addition to pellets. A good ole fashioned wristrocket without all the bells and whistles should work great as well. Crossbows have incredible range, and are pitch quiet. While most firearms will set you back at least five hundred bucks, you can get a decent crossbow for about 250 bucks. Having silent weapons are a big bonus because a loud noise will most likely attract more zombies. This will most likely be one of your best choices for long ranged targets since some crossbows take longer than others to reload. Consider about 60 yards to be your max distance on the undead targets and be sure to aim for the head! Try adding explosive tips for even more firepower. You can even find a pistol crossbow on amazon for only 11. It appears to be pretty powerful from demonstrations but you might not want to rely on it for long range. Can’t exactly afford an armoured vehicle to survive during the zombie apocalypse? It looks like you might have to settle for a volkswagen toureg which still offers quite a bit of quality for a quality price. If you need some more space and a good off road vehicle, then a route to go would be with the volkswagen touareg. No one would dare going off road with an expensive Porsche Cayenne. Many will compare the two types of vehicles and some will still take the tuareg over the porsche since it can simply handle more obstacles that are thrown at it. Some have complained a little bit about it’s seating since it doesn’t offer more than 5 seats but do you really need more than that for a pricetag under 10,000? Higher mileage versions can sell for as low as $7,500. It might be extremely difficult and expensive to have a back up generator to warm your home up when the zombie apocalypse is finally here. The power will most likely go out which means your air conditioner most likely isn’t going to work. What would you do in this situation? It might turn out alright if you get one of these emergency thermal blankets. It can bring you the best of both worlds by giving you the warmth during a cold night and coolness during a hot day. They’re even used by uber eats drivers to deliver hot or cold beverages to keep them at a stable temperature. For only about 10 bucks each it doesn’t seem like a bad idea to have a few of these just in case.